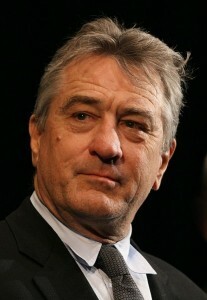 The Cannes Film Festival has yet to release the selection of films for 2011 but they have announced the president of the jury: Robert De Niro. The 67-year old veteran has already been president of the Cannes Film Festival Jury in the 1980s and has pronounced himself “very honoured and happy to head the jury for this year’s Cannes Film Festival.” And, as co-founder of the Tribeca Film Festival in New York, this is a man who knows from film festivals. Not to quibble, but much as I appreciate De Niro in the public eye, I appreciate him a lot more on screen and I don’t mean in a movie with “Fockers” in the title. Why can’t we have another Scorcese-De Niro collaboration? Come on, guys. Two strong movies at this year’s Cannes Film Festival zoomed in on the state of couplehood and singlehood. Mike Leigh’s “Another Year” featured the kind of marriage that the director himself described as “ideal”. Tom and Gerri are kind, intelligent, cultivated and supportive of each other. They garden and cook together while occasionally fretting over their son, Joe. Enter their single friends, Ken and Mary, both falling apart in ways that range from comic to poignant to pathetic. The stability of Tom and Gerri’s marriage seems only to be buttressed by their frazzled friends. At what point do you have to say “enough!” to your friend’s neuroses? Desperately confronting middle age, Mary hits on the much younger Joe and is rebuffed. When she is openly rude to Joe’s new girlfriend, Gerri finds she must distance herself from her friend. In a stark contrast to Leigh’s contented old marrieds, “Blue Valentine” is a heartbreaking portrayal of a failed marriage. Played with soul-baring naturalism by Ryan Gosling and Michelle Williams, Dean and Cindy are pained and bewildered by their wrecked marriage. Both are “good” people, kind to the elderly, attached to their daughter and their dog. And yet it all goes so horribly wrong. The film intercuts scenes of their courtship and marriage with their current agonies encouraging the viewer to try to pinpoint the fatal flaws that punctured their love. There are no easy answers; maybe there are no answers at all. Maybe they were simply unlucky to have found one another just as Mike Leigh’s couple had the immense good luck to meet their soul mate. During the first 20 minutes of Xavier Beauvois’ Of Gods & Men (Des Hommes et Des Dieux) I thought “Oh no. Another boring Cannes Film Festival auteur special”. Not much happens. A half-dozen monks sing prayers in a rural monastery. They garden and cook. A doctor receives ailing villagers. A young woman wonders whether she’s in love. Ho-hum. But the film snowballs into a shattering dramatization of the conflict between spirituality and practicality, Christianity and radical Islam and, yes good and evil. 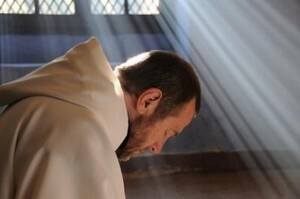 Based on a true story of a monastery trying to survive the onslaught of radical Islam as it sweeps through Algeria, the film delves deeply into the predicament of monks trying to decide whether to stay or leave. As violence and terrorism bear down on them, each monk must excavate their souls. What is a good life? How far should their commitment to serve the villagers go? What is the Christian way? The acting is superb; each monk is highly individualized. With little exposition, we feel as though we know these men intimately and care deeply about them and their fate. Profoundly spiritual and emotionally powerful, this highly intelligent movie is bold enough to ask the big questions and trusts the audience to find their own answers.